Some of my favorites reasons to own investment real estate include Cashflow, Tax Shelter, and Equity Growth. My least favorite part of owning real estate is managing tenants and toilets. Managing rental properties can be a difficult and disheartening task, but it does not have to be. Savvy investors know the key to creating Hassle-Free Cashflow is professional property management. Developing a working relationship with the right property manager team, takes the hassle out of investing and ensures the cashflow will keep rolling in! 2) Why your property manager should be the most important person on your investing team. 3) What is and is not reasonable to expect from a great property manager. 4) Three warning signs your property manager is stealing from you or worse! 5) How to interview for a great property manager when you are new to a market. 6) The dos and don’ts of firing your existing property management team. 7) Four property management secrets to improve your profitability and cashflow! 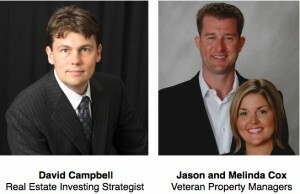 David Campbell (www.HassleFreeCashflowInvesting.com) is a professional investor, broker, syndicator and developer who enjoys counseling clients on creative real estate investment strategies. Jason Cox has been in the real estate industry for 18 years. He works to serve real estate investors as a property manager and private real estate consultant focusing on residential properties.